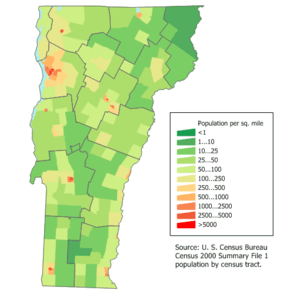 Vermont (IPA: /ˌvəɹˈmɑnt/) is a state in the New England region of the northeastern United States of America. The state ranks 45th by total area, and 43rd by land area at 9,250 square miles, and has a population of 608,827, making it the second least populous state (second only to Wyoming). The only New England state with no coastline along the Atlantic Ocean, Vermont is notable for the Green Mountains in the west and Lake Champlain in the northwest. It is bordered by Massachusetts to the south, New Hampshire to the east, New York to the west, and the Canadian province of Quebec to the north. Thanks Wendy. This is much more pleasant. Hope your trip went well.